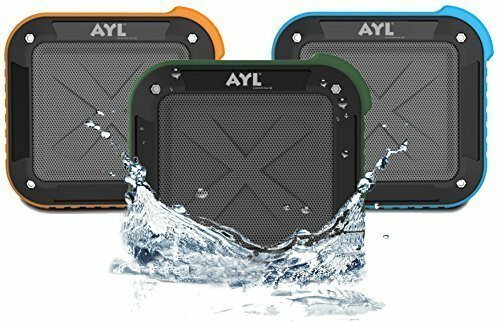 Home › Electronics › Best Portable Outdoor And Shower Bluetooth 4.0 Speaker By Ayl Soundfit Waterp..
Best Portable Outdoor And Shower Bluetooth 4.0 Speaker By Ayl Soundfit Waterp..
Best Portable Outdoor and Shower Bluetooth 4.0 Speaker by AYL SoundFit, Waterproof, Wireless with 10 Hour Rechargeable Battery Life, Powerful 5W Audio Driver, Pairs with All Bluetooth Devices, with FREE 2-day Domestic Shipping! That's why you need the SoundFit Waterproof Bluetooth Speaker, the latest innovation in portable speakers that will let you safely stream music from your mobile devices anytime, anywhere! Many Bluetooth speakers on the market today just don't offer premium sound quality, but the SoundFit wireless shower speaker is different! It features a powerful 5-watt audio driver, allowing it to give you concert quality sound wherever you go. Compare that to the 3-watt audio drivers found in many outdoor speakers, and it's easy to see why our Bluetooth shower speaker is the absolute best choice for those who want to hear every note of the melody and feel the bass thumping. You can enjoy up to 10 hours of music anywhere you go, and our wireless speakers outdoor housing is rugged enough to withstand routine bumps and shakes when you're transporting it.When it does come time to charge, you can have the battery completely replenished in just 4 hours, so you won't be without music for long! Don't settle for silence any more! Get the freedom to listen to music anywhere with the SoundFit model that is more durable, water-resistant and powerful than other portable Bluetooth speakers! 3 Year Worry Free Warranty is included. Click the "Add to Cart" button to Order NOW!